At Visualise Training and Consultancy we work nationally and internationally with organisations and businesses to increase awareness of the accessibility challenges faced by employees and customers with disabilities. 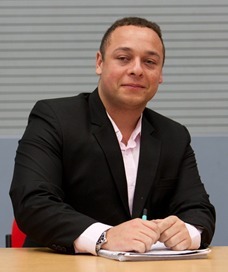 Founder, Daniel Williams, who has an eye condition called Retinitis Pigmentosa which causes gradual sight loss, established the business in 2014 to share his knowledge, experience and expertise in this field and we have been expanding and extending this remit ever since. We offer insights and practical solutions to encourage organisations to make their services more inclusive and accessible. From extensive research and personal experience, Daniel concluded that many employers and front line staff were unsure of how to communicate effectively with people with disabilities so he devised interactive training programmes to help them overcome this. These include disability and visual impairment awareness, coupled with inclusive teaching practices and assistive technology training for people with visual impairment. We also offer workplace assessments, small business mentoring, market testing and mystery shopping services. To empower organisations with the skills and knowledge to deliver inclusive services to customers with disabilities. To raise awareness of disability issues, support businesses to become disability confident and foster within wider society a commitment to deliver greater inclusion and equality for all. From Daniel’s own experience and extensive market research, he found that many employers and employees were unsure on how to correctly assist with, or communicate effectively with people who have disabilities. This gave him the motivation to establish a training and consultancy business to contribute and raise awareness in making a positive change within organisations and society. I established Visualise in 2014 with help from The Prince’s Trust as having experienced gradual sight loss, I wanted to advance social change for disability rights by campaigning and advocating for inclusion, equality and diversity. As a qualified eye clinic liaison officer and rehabilitation assistant and with the help of my guide dog Zodiac, I carry out workplace needs assessments and web accessibility audits throughout the UK to support employees with visual impairments. I also deliver training sessions that educate staff to better assist clients or customers with disabilities and have worked with over 700 organisations across all sectors. When employees are ‘Disability Confident’, inclusion becomes business as usual for everyone involved leading to increased job satisfaction and a more rewarding environment. Currently I’m delivering ‘Seeing Beyond the Eyes’ CET workshops across the UK to foster closer links between the optical and sight loss sectors to benefit patients and we are encouraged by the resulting improvements. In a voluntary capacity, I’m on the RNIB Working Age and Transitions steering groups which assess work related challenges blind and partially sighted people face. I’m also a Young Ambassador for the Prince’s Trust and sit on their Business Launch panels, helping other young people to start their own enterprises. I was recently appointed as a member of the College of Optometrists’ Public Patients Reference Group (PPRG) which gains input from patients and the public to their policies, guidance, and patient resources. At the beginning, sight loss feels like the end but later you realise it’s just the start of seeing in a different way and having a new outlook on life. Overcoming my challenges has given me resilience, determination and the ambition needed to be successful.